The Aria MHT is a Visaton design with Visaton magnetostats MHT 12 and the top notch Visaton TI 100, titanium midrange driver. 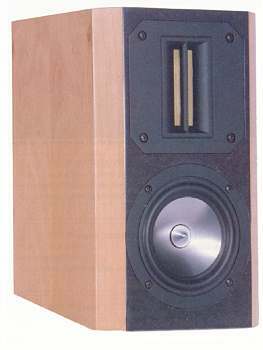 ... "Placed on sand filled Atacama speaker stands approx. 30 cm away from the wall, these speakers displayed a surprisingly low bass. All right, with the right music material it was noticeable that this was a bit cheated: Ray Brown's double bass (We get Requests, Oscar Peterson Trio) lacked the necessary body. "The Cost of Freedom" by Marla Glen on the other hand, was rich and voluminous. Afterwards we added the subwoofer. After some experimenting the crossover control was set to just above medium. This way the Ladylike subwoofer fitted the two TI 100 perfectly. Now, Ray Brown's double bass sounded the way it should be: deep and tight. Once again the use of the subwoofer displayed a considerably enlarged and more realistic sound stage. At the 2006 fair in Gelsenkirchen we demonstrated this effect with great success. Nobody noticed that really small speakers were at work. Visaton's magnetostatic tweeter again displayed a pleasantly soft and well balanced sound with absolutely convincing resolution and great attention to detail. The midrange scintillated with crystal clear and concise vocals. Great! Obviously, there limitations regarding the dynamics. The TI 100 with not much more than 50 square centimetres of radiating area has to work really hard when low bass has to be reproduced. Even though this driver doesn't radiate much below 80 Hz the amplification is absorbed and turned into mechanical diaphragm movement. That's the main reason the volume cannot be turned up that much." "The Aria MHT is first of all a really tempting small loudspeaker with a sound that suggests - up to medium volume - a much bigger cabinet. In conjunction with the Ladylike subwoofer the sound becomes an experience that would give credit even to really big speakers." If you intend using this speaker with a valve amp an impedance correction should be used. For the high-end version we recommend in the path to the Visaton TI 100 cfc copper foil coils and MKP capacitors throughout. In the path to the magnetostat a low-loss Mundorf Supreme CAP is being used. If you don't want a DIY crossover kit we recommend the original Visaton kit.